Just announced today, Disney Visa Card Members can now book a Walt Disney World Resort vacation for stays between 8/16/09 - 10/3/09 and receive the Disney Dining Plan for FREE! For now the offer is only available to current Disney Visa Cardholders. Book a vacation between now and June 21st for the dates shown above. Offer is good for all resort classes, but a limited number of rooms are available with the deal. You must purchase at least 1 Day MYW tickets as part of the package. The Standard Disney Dining Plan is included for free. This entitles each person to One Counter Service Meal with drink and dessert, one snack, and one table service meal with drink and dessert for each person for each day of your stay. You can upgrade to the Deluxe Dining Plan for an extra fee. This is really a great deal. The Dining Plan costs $39.99/day + tax for adults (10 years old +) and $10.99+ tax (ages 3-9). If you have a family of 4 where the kids are 10 or older then the Free Dining is worth $159.96 + tax per night of your stay. Book directly through Disney at (407) 939-7708 or use rate code RYI with your travel agent. 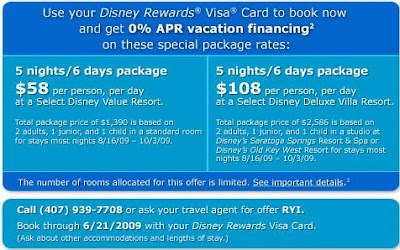 Currently this offer is only available to Disney Visa cardholders, but a general public version of this deal is expected to be available starting on March 30th. I will post this information as soon as it is available. 0 comments to "Disney Visa Free Dining Offer Now Available"